FATHER Christmas has shut down Gladstone's main street - well sort of. Goondoon St is closed at the moment, as a crane puts up Gladstone's Christmas tree. 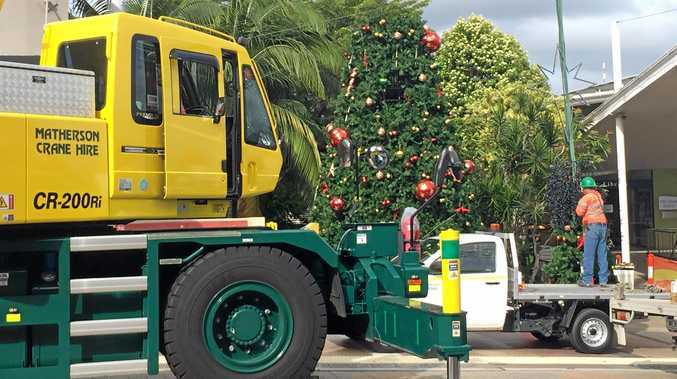 Goondoon St closes for Christmas tree: Father Christmas has shut down Goondoon St.
A witness said workers were currently attempting to untangle some Christmas lights near the top of the tree. The tree is opposite the Gladstone Entertainment Convention Centre and in front of the Gladstone City Library. Detours are in place on Goondoon St but the businesses are still open and people can walk through. Local company Matheson's Crane Hire are doing the heavy lifting.